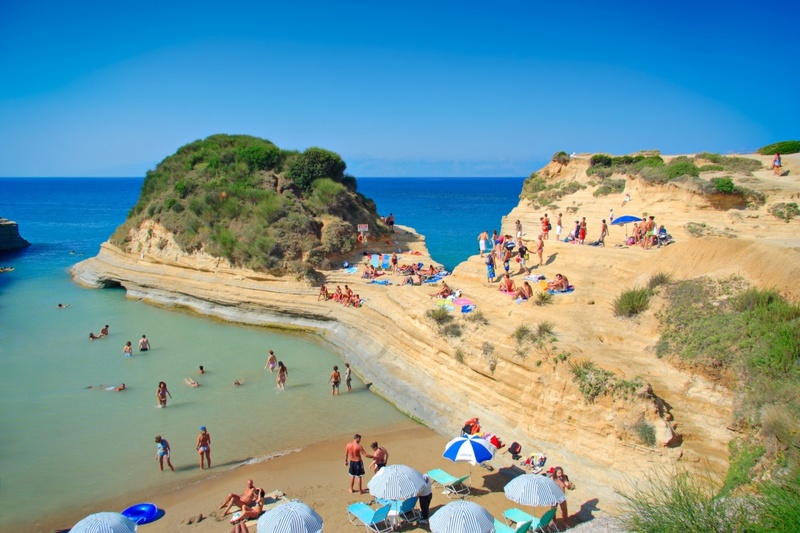 The 217 km coastline of Corfu features 30 beaches that have been awarded the Blue Flag within a fascinating natural setting. Most of the beaches are well-organized with a good touristic infrastructure. In Corfu Town, you'll find the beach of Mon Repos and in the north-west the beach of Saint Spyridon, the wetland of the Antinioti lagoon as well as the beaches of St. Stefanos, Dassia, Kalami, Kerassia, Kouloura and Ipsos. Heading further up to the north-west, you'll discover the fanstastic beaches of Agios Georgios, Arilla, Longa, Roda and Sidari with the famous 'Canal d'Amour'; the 'Channel of Love'. In the West lies the beach of Paleokastritsa, one of the most popular on the island. In its central part, you'll find the beaches of Agios Gordis, Glyfada, Ermones, Kontogialos and Myrtiotissa, a nudist hangout. The south coast covers the beaches of St. George Argirades, Arkoudilla, a beach beneath a lush forest with difficult access, Gardenos, Kavos, Messonghi and Paramonas. Also, the villages of Benitses and Molos are popular tourist destinations. On your first visit to the Queen of the Ionian, you shouldn't miss to visit Sidari. Here you encounter endless beaches and stunning sandstone formations, that let the sea play with the land in various fantastic shapes. On the west side, you'll see the fjords and the famous cave 'Canal d 'Amour'. The fame of this canal has spread all around the world. The tradition says that the swimmer entering the channel on the one side will meet the mate of his dreams when reaching the other side. Here, you'll find an organized waterpark while in the harbor you can find boats for daily excursions to the neighboring islands. Also magnificent is Paleokastritsa with its six beaches in one of the most popular touristic areas of the island. Meanwhile the beach of Agia Triada enchants visitors with its deep waters. Water skiing, parasailing, rental boats, bars and restaurants are just some of the facilities that can be found in the area. The most scenic and popular beach on the island is undoubtedly Agios Spyridon, overlooking the cliffs and offering a fully developed infrastructure. Agios Petros is another favorite beach with sand and pebbles and particularly attractive for water sports lovers. St. Don't forget to visit Ampelaki as well, a quiet beach with deep waters, where you can't only rent umbrellas but also boats. Only a breath away from the city and near the marina of Gouvia, you will find Kontokali with an impressively large sand beach and hundreds of umbrellas. In Mirtiotissa you'll discover one of the most beautiful beaches of the island. Access is granted 4x4 and requires a 20 minute walk. However, it's worth the effort. The rich seabed, the golden sand and a creek with fresh water flowing from the cliffs into the sea, will compensate you for everything. Finally, in Agios Georgios Pagi you'll discover a paradise of sand between rugged rocks, leading to the sea forming breath-taking coves. In Halikouna a narrow strip of land separates the beach from the lagoon of Korission. If you head past the dunes and reeds, you'll find yourself in a rare cedar forest with ammophilous orchids.